- After babying my knee for the past couple of weeks I decided to test it out without my knee brace and trail run one of the easier 4K's for my RUN NH48 project (click here to view details). I chose Mount Garfield because of the easy grades and forgiving footing as it follows an old fire warden road from the firetower days of the early and mid 1900's. 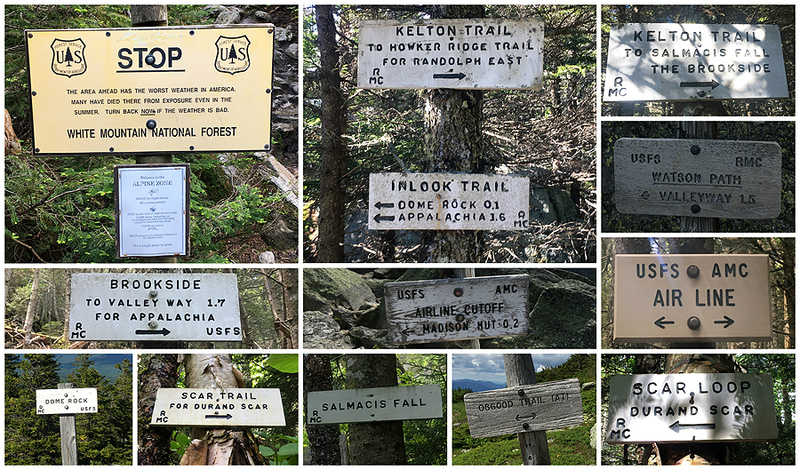 The trail only gets steep and rough for the last two tenths of a mile up to the summit. I'm happy to report my knee felt fine, albeit a little sore afterwords, but I was able to really open up my stride over the last few miles during the descent making quick work of Mount Garfield. - On Saturday the weather in the morning was rainy and humid, luckily by early afternoon the nasty weather had blown through the mountains so I headed around the corner for a quick hike of Mount Madison. I started off on the very busy Valley Way Trail running into descending wet hikers who had been caught in the morning rain storms. To get away from the crowds I hooked onto the Scar Trail over to Airline, only seeing a few hikers along Durand Ridge and about a dozen hikers from the hut to the summit along the Osgood Trail. Not wanting to hike with the crowds I opted to descend the Watson Path. Every time I hike this trail I am quickly reminded how rough and rugged it is! Once below treeline I hooked onto the Brookside to Kelton to Inlook for a very nice scenic descent back to Appalachia. - Sunday, Whitney and I headed to hike Goose Eye and Mount Carlo, both are located in the Mahoosuc Range. 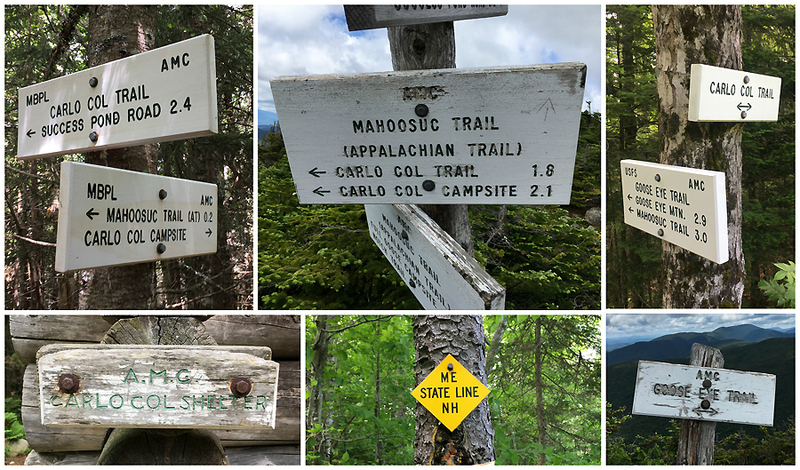 Our hikes to and from both summits were over very nice trails, Goose Eye and Carlo Col trails, while our hike between both peaks was along the rugged Mahoosuc Trail. Views from Goose Eye are phenomenal and we had the summit and trails almost all to ourselves as we only saw two other hikers all morning. The toughest part of the day was driving down Success Pond Road, the trailhead was down an eight mile dirt logging road, the first couple of miles of the road are quite rough while the rest is much better although it has occasional potholes. - On Tuesday I joined Whitney on a quick hike into Maine before work. We headed over to Wild River Road to hike East Royce with Katahdin the German Shepard, we were dog sitting for our friend Elizabeth. These trail were very beautiful through lush green woods with good footing. There is also a really good view from the summit of East Royce which sits just east of the New Hampshire border in Maine. 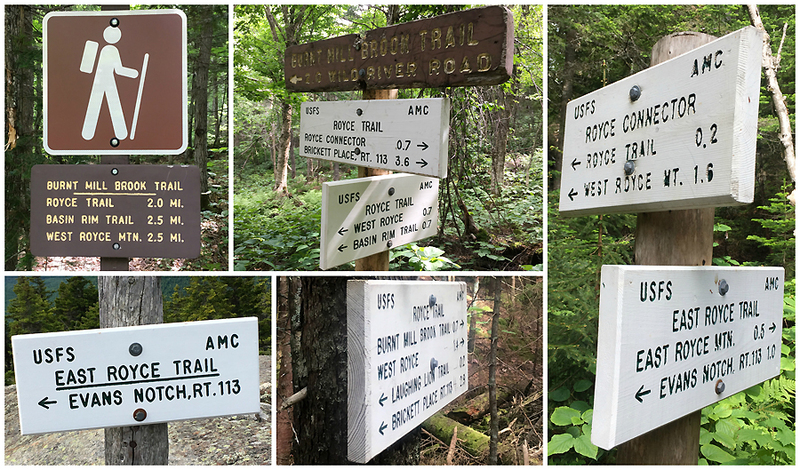 If you're looking for beautiful trails with few people head to the Speckled Mountain Wilderness in Evans Notch, it's well worth the drive to hike some lightly used trails. - Wednesday after work and after a few downpours, I drove down NH 16 for a few miles for a quick trail run of the Imp Face loop. I had forgotten how horrible the trail is the first mile below the trail junction with the North Carter Trail heading south. very slippery roots, rocks of all sizes, water both running and standing on the trail. This is a short loop, just 6.55 miles according to the White Mountain online guide but it packs quite the punch gaining 2,358 feet, most of which are slammed into the first two miles. The trail has a variety of conditions too, from gradual grades with gentle footing, to steep bursts with very rough footing. Hiking along the Scar Trail (left),and Airline (right). Airline sees a lot more foot traffic and that is why the rocks are visible from the high use. Signs spotted along the way! Heading south towards Mount Carlo. This is such a beautiful spot. The Goose Eye summits along the Mahoosuc Range have alpine meadows, few people, and views for days! The last few tenths of the Carlo Col Trail is along an old logging road, lots of wild strawberry's to eat along here! Kathadin is king of the hill!